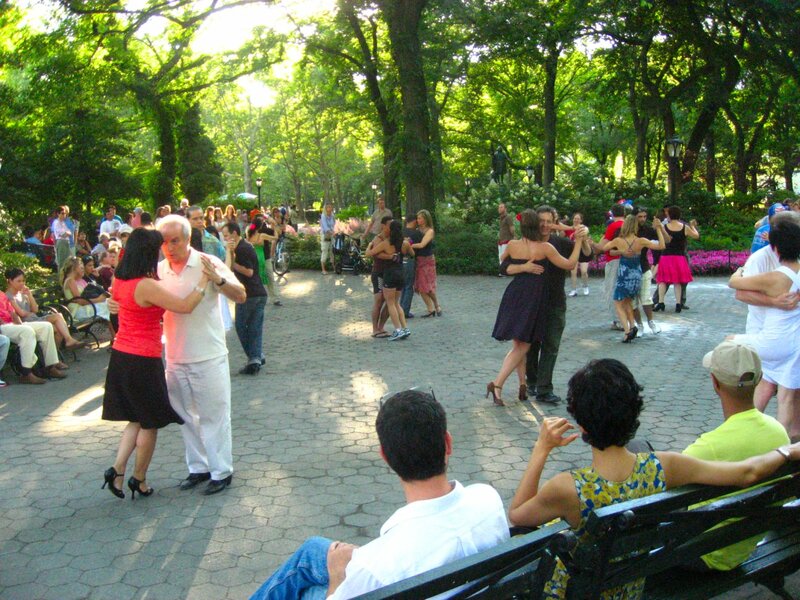 Tango in the Park: Programming public space is a key element of increasing public safety, interaction and vibrancy. As of October, 2011 Toronto, according to Emporis a Frankfurt-based research company that tracks multi-story buildings, had 132 active high-rise construction projects, the most of any North American City, surpassing Mexico City’s 88 projects and New York City’s 86 projects. You hardly need scientific research to appreciate the effects of this disparity. Some of the more tangible consequences include crowded sidewalks, subways, street-cars, and buses. I’m quite certain I’m not the only one to have waited for three subway trains to pass before being able to squeeze into one, or had to brave the roadway when sidewalks are overflowing with pedestrians; and these aren’t the only issues. How do we ensure that liveability is not compromised – that the city develops for people,not just for the sake of a revenue stream? This is a complex question with many answers; some of which have been addressed by refocusing planning on the principles of smart growth in an effort to facilitate urban development that is fiscally, environmentally and socially responsible, while recognizing connections between growth and quality of life. The City of Toronto has taken steps in the right direction toward making density more liveable by commissioning the Tall Buildings Downtown Project that resulted in the completion of a study entitled “Tall Buildings, Inviting Change in Downtown Toronto” in April, 2010. The study recommends a vision and performance standards for tall buildings in Downtown Toronto in order to improve the pedestrian environment; minimize shadowing of sidewalks, parks and public squares; protect landmark views and heritage resources; and, enhance the quality of life for people living and working in the core. While renewed interest in ‘smarter’ planning and more human-scaled urban design and architecture certainly contributes to downtown liveability, a more holistic view is required – a community is a great deal more than simply built form. It is comprised of people and of social environments just as much as built environments. As the consequences of higher energy costs become more apparent and downtown living increasingly more attractive, the time is ripe for the City of Toronto to commission a broader reaching study on high(er) density liveability. A study that reviews international high-density liveability best practices; surveys resident satisfaction with neighbourhood amenities, quality of life and social capital, access and linkages to community amenities, and walkability; assesses the quality of the public realm; and, surveys public activities (both stationary and pedestrian). The outcome of the study: recommendations how to improve downtown liveability – recommendations that when implemented, facilitates growth and development without compromising our ‘lived human experience’. This entry was posted in Planning and tagged community, design, government, planning, sustainability, urban planning. Bookmark the permalink.